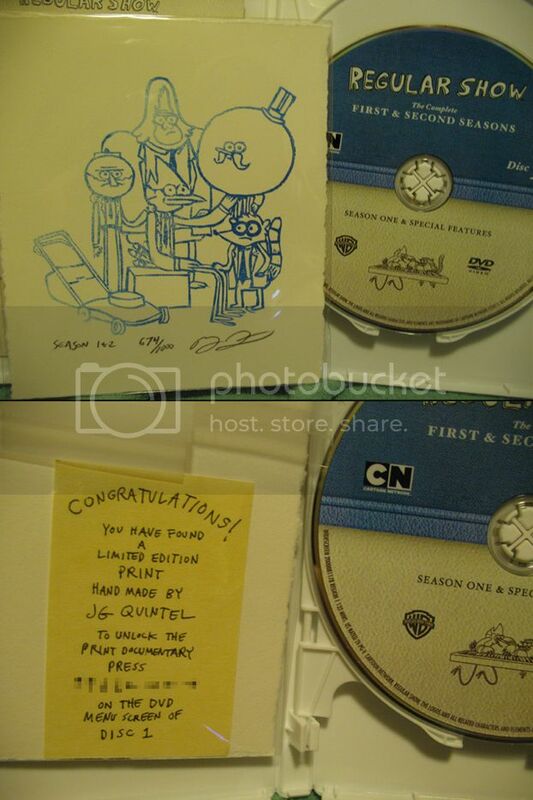 Did anyone else get one of these in their Regular Show Season 1 and 2 DVD set? Re: Did anyone else get one of these in their Regular Show Season 1 and 2 DVD set? So wait, JG hand drew a bunch of those and put them in the dvds? That'd be a lot of work. He hand etched a block, and printed /signed them. The code opens up a video and photo album of making the prints. The code comes from a season 2 episode (Over the Top). In the episode, Mordechai and Rigby are playing a guitar game, and Rigby messes up. While he's trying to get the game back on track, Mordechai yells out the special code to Rigby. Ive seen a few eps, it's alright. I miss Space Ghost Coast to Coast though.